Pauline Dowell, a blind sailor who lives aboard a boat in Boston Harbor, won the 2016 Robie Pierce One-Design Regatta for sailors with disabilities. 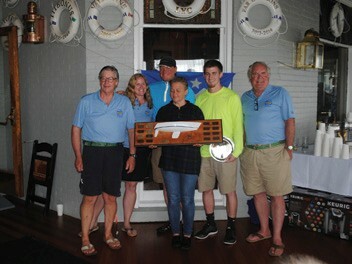 The event was sailed June 3-5 at Larchmont Yacht Club in Larchmont, NY and co-hosted by American Yacht Club in Rye, NY. Dowell’s success was shared with her all-Boston crew comprised of Christian Thaxton and sighted guide Kay Van Valkenburgh. After winning three of the of six races and taking a second in another, Dowell finished with a three-point lead over 2014 Blind Sailing World Champion and fellow Bostonian Matt Chao, who sailed with Larchmont YC’s Bill Blanchard and able-bodied sailor (AB) Bud Heerde. In third was Ted King (Brentwood, NH) with crew Jim Scott (Portsmouth, NH) and AB Bill Sandberg (Annapolis, MD). 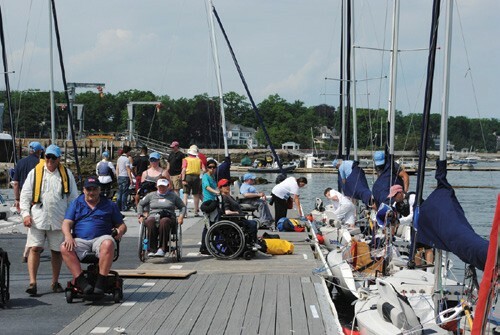 The three-day event found 16 specially adapted Ideal 18s sailing six races on Long Island Sound off Larchmont Harbor. Despite the competition and the sailors’ spirit being high, the weather didn’t cooperate. On Friday, sailing was postponed on shore for over an hour until a light southeasterly wind arrived. LYC PRO Cynthia Parthemos and her race committee managed to run three races, with Chao taking the opener and Dowell the next two. Saturday’s sailing was again postponed on shore awaiting wind, with another pair of heats run before the breeze ultimately died. Of note, on Saturday first-time Robie skipper, 14 year-old Tilghman Powers (New York, NY/Oxford, MD), sailing with Owen Zimmerman (New Rochelle, NY) and Tilghman’s father Philip, made his first mark on adaptive sailing. As the wind was dying, Tilghman held off the competition to win the fifth race. Severe thunderstorms were predicted on Sunday, yet a final race was completed before the heavens opened up. This year marked the eighth Robie Pierce One-Design Regatta, named after one of the founding fathers of adaptive sailing. Over the years, the Robie has become one of the country’s foremost regattas for sailors with disabilities. This year, with the inclusion of the Robie Pierce Women’s Invitational Regatta, over 50 sailors with disabilities were on the water over the weekend. Add to that headcount the volunteers from Larchmont and American Yacht Clubs plus community supporters, and this represents one of North America’s largest adaptive regattas. The Women’s Invitational, sailed Thursday June 2, included five races sailed stadium style inside Larchmont Harbor. Tracy Schmitt (Toronto, ON) and crew MiKayla Briere and LYC AB Alison Puleo bested the 6-boat fleet with a near perfect scoreline. The sailors, committee, volunteers and supporters would like to acknowledge the support of Heineken USA, Mercedes-Benz of New Rochelle, Keurig Green Mountain, and Burke Rehabilitation and Research. For results and more information about the Robie Pierce One-Design and Women’s Invitational Regattas, log onto larchmontyc.org/Yachting/Regatta_Schedule/Robie-Pierce-Regatta.aspx.